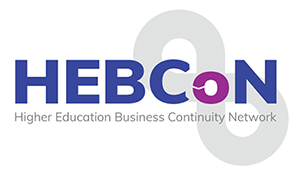 HEBCoN is a network of Higher Education Institutions (HEIs) in the UK and Ireland who are committed to sharing and promoting good practice in Business Continuity Management (BCM), risk management and emergency planning. HEBCoN became a professional body in 2007 and has since grown from strength to strength. Led by an Executive Committee and Regional Chairs, we offer expertise and support to our members in all aspects of business continuity. Our work is continually developing and our network continually expanding, changing the face of business continuity across Higher Education. Business Continuity Management (BCM) is important to the HEI sector as it ensures the continuity of teaching and research programmes and gives confidence to funding bodies that HEIs take managing risk seriously. Being a member of HEBCoN allows your institution to tap into a wealth of knowledge and expertise in Business Continuity Management. Our members are able to access a wide range of benefits, from networking with professionals to attendance at training events and being able to access a library of resources.For more information on joining HEBCoN and membership benefits please click here. The HEBCoN 2019 conference, sponsored by CriticalArc and R3S Global, was a resounding success. The 2020 conference will be held in Liverpool dates and venue TBC. The HEBCoN Team are delighted to announce that the 2020 conference will take place in Liverpool . Cultural capital, birthplace of The Beatles Liverpool has world-class attractions, a proud sporting history and beautiful outdoor spaces including Royal Albert Dock- located on Liverpool’s incredible World Heritage Site waterfront, independent eateries, boutiques and museums, house within this iconic collection of buildings. We will bring a host of new speakers and a variety of oppportunites for you to network and discover Liverpool. HEBCoN is very pleased to be in partnership with the BCI. Read more about out partnerships and associations with a range of organisations.